The Eastgate Centre is a modern, fully accessible, multi-purpose conference and events venue. It is equipped with catering facilities, wi-fi internet access and on-site parking for around 130 cars. The teaching sessions will take place in the main auditorium on the first floor (with lift access). A crèche room will be available for carers to look after children aged 4 and under. Please note there is no child-care provision for this age group. A separate children’s programme (Primary School age) will be provided during each of the main sessions. We have spaces for 30 children so we advise booking early to secure a place. The Christian Bookshop at Pratt’s Bottom will be providing a bookstall during the day. Complimentary hot and cold drinks will be provided on arrival and in the afternoon break. The Eastgate Coffee Shop will also be open and a range of drinks and snacks can be purchased throughout the day including bacon rolls, pastries, tea cakes and other cakes. 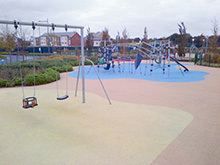 The centre is adjacent to a park with a well equipped play ground. There is a large Sainsbury’s supermarket a 10 minute walk away from the centre where lunch can also be bought.